I was not able to log into Blogger last week, so I was not able to post. But everything seems to be working now, so let's have a contest! 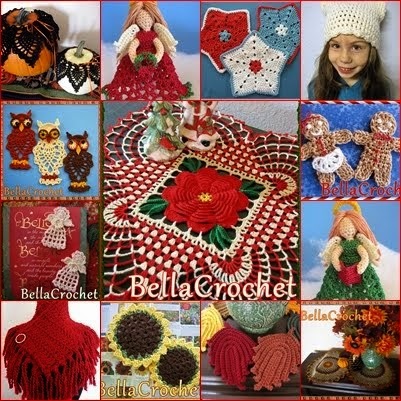 I will give one person their choice of any pdf pattern on my site, bellacrochet.com. I will select the winner at random, and send out the pattern on Monday morning (I will be out of town this weekend, so the contest will run a little longer than usual.) I will post the name of the winner here, so be sure to check back on Monday morning to see if you won. Are you crocheting any gifts for Christmas this year, and if so, what are they? This contest is now closed. Please come back next Friday to enter my weekly contest. I always crochet dishcloths for all the girls in the family...will probaby crochet some snowmen and snowflakes as well! If I have time . Don't know what yet . I want to crochet little socks for a christmas calendar. Every day a little candy for my son. i always make something unusual for my mum - not found anything yet tho so keeping my eyes peeled for that pattern that is a little unusual. This is one of the projects that I am working for Christmas. This is going to be a gift for my mother. It is a unusual in the fact that the shape is Oval instead of square, rectangle, circular. We don't give gifts at Christmas, but I am crocheting a birthday gift. I haven't thought about Christmas yet, but I'm making a little pilgrim set for Thanksgiving! with all the bad things/sad times . health wise and personal family life . thats hit me this yr so far i think i need the surrounding of angels to get me threw so ive bought/crocheted a few angels. it just somthing i feel i need to get me threw rest of yr. I make a lovely home made version of Bailey's Irish Cream for some of my very special friends at Christmas. I crochet Santa ornaments to hang on the bottle. I also make stuffed snowmen for some of the children we know and love. I will be crocheting gifts. I have one complete right now. And I have 3 others in the work. I made a hello kitty earflap beanie for a friend. Im going to be making slippers for my parents, a bearded beanie for my brother and a yoda beanie for my brothers bestfriend who is like a brother to me. Our family has gotten so large, we don't exchange gifts anymore. We just get together and have a food feast. 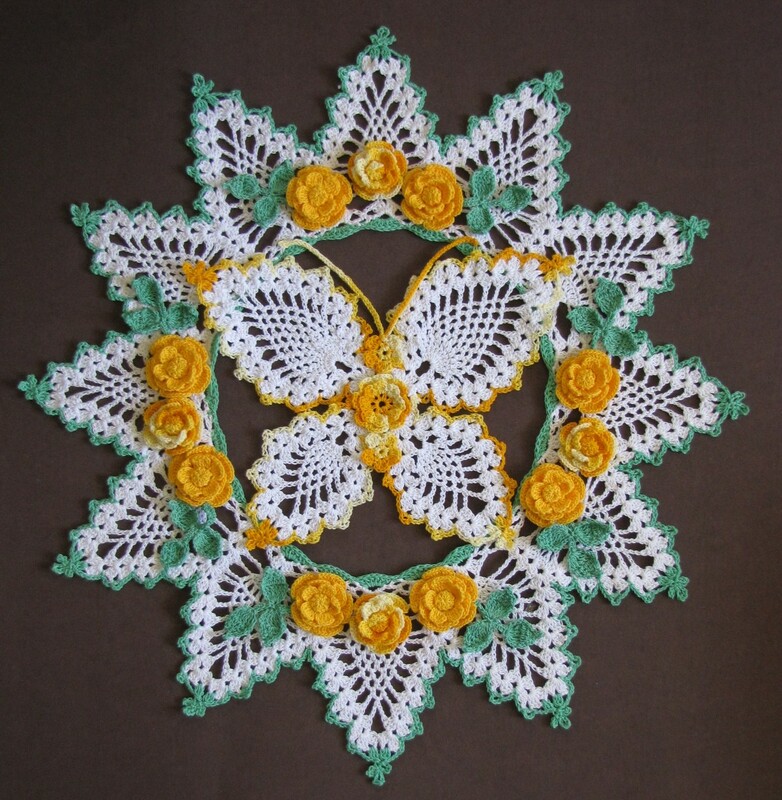 If I did crochet for gifts, it would be doilies. I want to crochet some angels for gifts for people I work with this year (if I get enough time!!!). 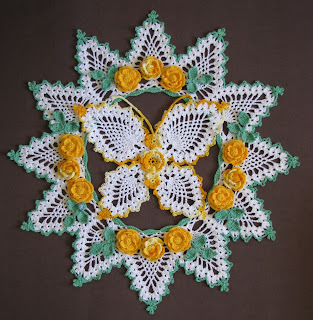 yes I am crocheting christmas doilies for my neighbors..
Oh where to start. I have already made a table runner and I have been designing a snowman kitchen set for a friend, my daughter wants a new scarf, then shhhh the kids are both getting something cool for Christmas that will need a case to cozy up in when they are not using them. Who knows what else is in the works. 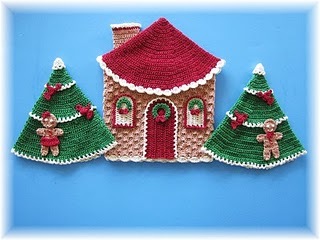 I will be crocheting doilies, angels, snowmen, some Santa, also a couple of small Christmas trees. Well on Friday I finished my first ever afgan with matching pillow for my daughter for Christmas. Whew...I'm I glad it's done. I love how it turned out. Earlier this year I made two pillows (filet crochet with thread)a kitty and a butterfly for my little grand daughters along with purses for each of them. I want to make them some wrist warmers and maybe bracelets too. So yep.. my hook has been smokin' :) All while remodeling a little house we purchased earlier this year. I think the crochet was my therapy at the end of a long work day.